“Gefilte fish” is fish prepared in a certain manner, a dish traditionally enjoyed by Ashkenazi Jews on Shabbat and Jewish holidays. In the Torah’s account of the creation of the world, the word “blessing” is used three times. The first is regarding the creation of fish, the second regarding the creation of man, and the third regarding Shabbat. When a human eats fish on Shabbat, he is thus the beneficiary of a triple blessing. Each letter in the Hebrew alphabet has a gematria (numerical value). The letters of the Hebrew word for fish, dag, add up to seven. We therefore honor Shabbat, the seventh day of the week, by eating fish. Perhaps most importantly: eating fish is an integral part of oneg Shabbat—the obligation to enjoy and engage in pleasurable pursuits on Shabbat. In Yiddish, gefilte fish means “stuffed fish.” Originally, the recipe for gefilte fish called for the flesh of the fish to be removed from the skin, ground up and mixed with other ingredients such as eggs, spices, and ground onions and carrots. The mixture was then stuffed back into the skin, and cooked or baked. The laws of Shabbat prohibit removing bones from fish,1 making fish consumption a bit tricky. Boneless gefilte fish circumvents this problem. In addition, including all the additional ingredients in the ground fish stretched the amount, so that poor families would have enough for the entire household. Nowadays, the gefilte fish mixture is usually not stuffed back into the skin, but the name remains. 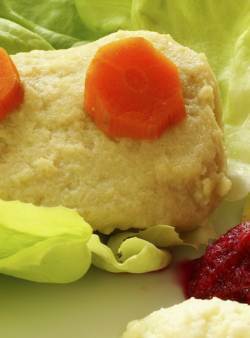 Gefilte fish can be bought ready-to-eat in jars, in frozen rolls—or you can prepare your own. Click here for some recipes. Removing bones falls under the category of borer, “selection,” one of the 39 creative activities prohibited on Shabbat. Click here for more on this topic. Why is it customary to eat fish on Friday night? Why do we eat Cholent on Shabbat? Why are some not particular to eat bread during the third Shabbat meal? What is the rule regarding eating on Shabbat foods which have words on them? Not even remotely like tuna salad. It's ground up fish with spices that is cooked by boiling or occasionally baking. It is a tasty lump of cooked ground fish. It is usually eaten with horseradish. it is tasty and lumpy. watch what you doing and saying, otherwise you might make people eat treif and they may feel and you will get their avairo. 2. if bones are not to be eaten why is it ok to cook the gefilte fish with the head and bones? Oh, and what happens if during eating the gefilte fish a bone is found? Is it then thrown away? Please correct me if I am wrong about this. It is a good opportunity to make sure I am understanding the rule perfectly. As I understand it, if we have a mouthful of food and there is a bone or pit or other material in that mouthful which should not or cannot be eaten, we consume or otherwise isolate, (while still in our mouths), the edible or desireable part from the bit we intend to discard. When we have separated (in our mouths) the good edible part from the part which will be waste, then we can expel the waste without violating the rule against borer during Shabbos. why do fish have bones? I also love love love pickled herring! Oh yummy. I want to be a member of your pickled herring club! I would even travel to Texas for pickled herring since I imagine, like everything else, the pickled herring is bigger in Texas!! Wow! Gefilte Fish Really ? Gefilte Fish in truth, is much more than we understand. It is yes, a "product," but a product that involves removing fish, marine life, from the environment where they live, breath, bear their young, and survive. Scientists now know that all fish, including crustaceans, feel some form of suffering and trauma when slowly suffocating out of water. WHy wouldn't they? The oceans today, are being polluted and acidified with excess Co2 to the point that the life of oceans, corral reefes, are dying. Overfishing is emptying the waters and killing tens of millions of non-target species. Common mistake While borer might be a nice added benefit of eating gefilte fish, it is not the reason our ancestors ate it. The real reason is that fish was not cheap and sometimes hard to come by so by grinding it up and adding filler you can make one fish feed more people ( as you mentioned). Eating fish with bones on shabbos is completely mutar, you just need to take the fish from the bone and not pick the bones out of the fish. gefilte(r) fisch In the previous age and before WW 2, when the Jewish community was much larger than now in my country, the Netherlands, on Shabbath eve was it common to serve carp, a kosher fresh water fish, indeed fried in it's own skin, with bones or even boneless and prepared hours before Shabbath began. Gefilte Fish not understood In the modern day, those who are not familiar with it, have faces full of disgust when gefilte fish is mentioned, even though they've never even tried a bite. However, what I do is to tell them that gefilte fish is to fish what hamburger is to meat. Ground up fish vs Ground up meat. I never learned to make gefilte fish - so the gel kind in the jar is revamped by me. I extract the gel from the jar, put it into a small sauce pan, add onion, sliced carrots, pepper, a bit of dill, and simmer until the carrot are the way I like them. Let cool - and pour liquid and carrots back into jar, over the waiting fish. The onions get tossed. Refrigerate and the next day ENJOY your 'homemade' gefilte fish. Almost as good as Mom and my two aunts made.